Chevron reported quarterly profits that topped Wall Street’s expectations, as the company’s fossil fuel production hit an all-time high and executives forecast solid output gains for 2019. Shares of the company were up about 3 percent at roughly $118 a share on Friday. Chevron’s production of oil and natural gas increased 12 percent to 3.1 million barrels per day of oil equivalent in the quarter, bolstered by new liquefied natural gas output from its Wheatstone project in Australia and surging supplies from its wells in the Permian Basin, the top U.S. shale field. For the full year, Chevron reported record production at 2.93 million barrels per day of oil equivalent. The company expects production to rise by another 4-7 percent this year, based on its forecast for $60 Brent crude oil prices. 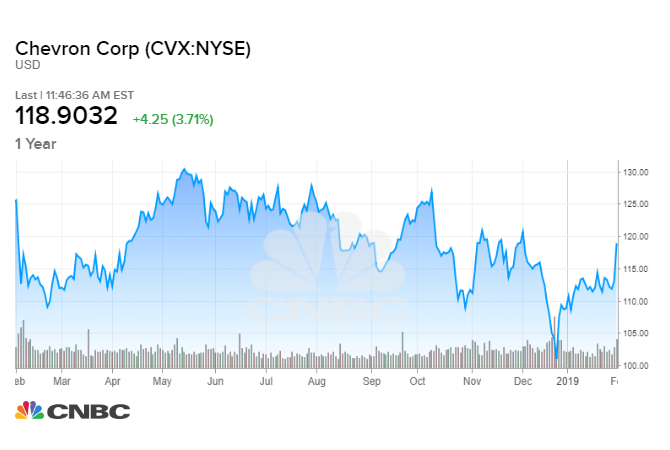 “We expect positive production trends to continue in the fist quarter and throughout 2019,” Chevron CEO Mike Wirth said during a conference call on Friday. Chevron’s profit for the final quarter of 2018 jumped nearly 20 percent, to $3.73 billion, or $1.95 per share. Analysts had been expecting earnings of $1.87 per share, according to Refinitiv. The earnings beat was largely attributable to lower charges in the quarter due to tax impacts. Chevron faced just $419 million in charges last quarter, compared with $3.46 billion a year ago. The San Ramon, California-based oil major generated $42.35 billion in revenue, compared with the $46.13 billion forecast by Wall Street. Chevron’s lower expenses offset a drop in earnings in its main business lines from a year ago. Profits in Chevron’s upstream business producing oil and natural gas fell nearly 38 percent from the year ago period to $3.29 billion, also due to U.S. tax impacts. Earnings fell by a third to $859 million in Chevron’s downstream unit, which focuses on refining and selling fuels like gasoline. Profits from international refining operations rose seven-fold to $603 million due to better margins and currency factors. That offset tax impacts that dragged on U.S. downstream earnings.